I found Rustoleum Bright Coat Metallic Finish in Dark Bronze at either Lowe's or Home Depot. It was maybe $5. I'm hoping that it is a close 2nd to our beloved ORB, but at least it's a start! Hey! I just wanted to let you know that you can use the 40% off a regular price item coupon for the spray paint at Joann's. I've done this at michaels too. It's just a few dollars savings.. but $5 is better than $8! 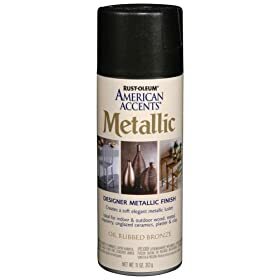 I see someone else has already mentioned it, but I was going to say I also saw the Rustoleum Dark Bronze at Home Depot. Can we start a petition for them to bring it back??? Be sure and sign up for the coupons at Joann's/ It takes several weeks before you start getting them. Oh-did you receive your give-a-way gift from me. I shipped it a couple of weeks ago. I love my ORB spray paint and I've been hoarding a couple of cans because it was so hard to find! I'm glad you've been working to find a replacement. Also, I was just reading your "heirloom" post about your grandmother's china cabinet. My grandmother had one just like that! It is currently in pieces in my basement because my father took it apart and could never get it back together. I'm not sure WHY he did that, but now I've got to find a furniture guy to fix it. I love it for it's simplicity. Thank you for sharing your picture. It makes me want to get it repaired quickly! I noticed you live in Oklahoma, so the best little known secret is that at Renovation Station down on 10th street and Broadway in OKC, you can find the entire line of American Accent colors for $1.29 a can! Lowe's cleaned out their entire line and passed it on to them! Have you ever been? Everyone should find their Habitat for Humanity retail shop in their area and visit it ASAP! Just found your blog. Love it! I live in Daybreak and love that you featured our floor plan. We love it here. Thanks for the fantastic ideas. Go to www.hardwareworld.com - they sell the rust-oleum orb paint in sets of 6 cans for $33.42. They said rust-oleum has not discontinued this item, and they will continue to sell it as long as rust-oleum makes it.